Each winter on the shores of Cape Cod, dolphins strand themselves and are unable to get back to sea. No one is sure why this phenomenon occurs, but it's happened for hundreds of years, and has been largely manageable until now. The strandings have taken on new complexity this year. 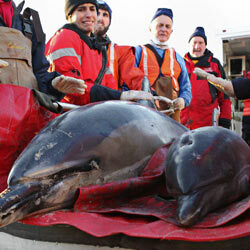 almost two hundred of dolphins have stranded themselves on Cape Cod's beaches. The International Fund for Animal Welfare (IFAW) has been working around the clock to save the dolphins and send them back to their natural habitat. But the rescue project is in danger because its funding — money that comes from the John H. Prescott Stranding Grant Program — is in danger of being cut. At this dire time, the last thing rescuers need is depleted funding. Sign below calling on Senator Scott Brown to continue his important work in saving marine mammals and to advocate for the continuation of the John H. Prescott Stranding Grant Program. I am writing to you today because you have continuously demonstrated your commitment to the preservation of marine mammals, and a situation currently occurring in Cape Cod needs your attention. As you may know, each winter small groups of dolphins strand themselves on the shores of Cape Cod, rendering them unable to return to sea. No one is really sure why this happens, but in the past the phenomenon has been manageable and the dolphins have been safely returned to their habitat. This year, though, unprecedented numbers of dolphins are stranding themselves, challenging rescue teams and exhausting available funding. The John H. Prescott Stranding Grant Program — where the funding comes from — is in danger of being cut from the federal budget. You previously sponsored the Marine Mammal Protection Amendment Act — the bill in which the Prescott Stranding Grant Program originates. Please help rescuers to continue their life-saving work by opposing the cut! 5/15/12: 15,636 signatures sent to Senator Scott Brown. Please continue to sign for this important cause if you haven't already! That's 31,329 signatures! Let's keep the ball rolling.